Jesus received power after being baptised by John the Baptist. As he was praying, the Holy Spirit descended upon him like a dove (Luke 3:22). The first disciples received power from on high discerned as tongues of fire which rested upon their heads (Acts 2:3). Presumably, they too were praying because Acts 1:14 reveals that, “they all joined together constantly in prayer.” The believers in Samaria received the anointing of the Holy Spirit when Peter and John laid hands upon them (Acts 8:17) after praying for them (Acts 8:15). The believers in Caesarea received the power of the Holy Spirit as Peter was preaching to them (Acts 10:44). 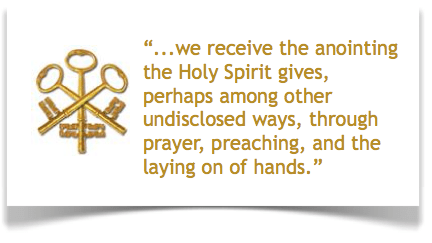 From this evidence, I conclude that we receive the anointing the Holy Spirit gives, perhaps among other undisclosed ways, through prayer, preaching, and the laying on of hands. The Samarian believers received the empowerment from above through the instrumentality of physical contact. In the case of those living in Caesarea, the spoken word provided the point of contact and the conduit for blessing. When the apostles in Jerusalem heard that Samaria had accepted the word of God, they sent Peter and John to them. When they arrived, they prayed for them that they might receive the Holy Spirit, because the Holy Spirit had not yet come upon any of them; they had simply been baptised into the name of the Lord Jesus. Then Peter and John placed their hands on them, and they received the Holy Spirit. The scriptural witness is clear that a response to the infilling of the Holy Spirit was speaking in tongues. However, at other times people prophesied. In Paul’s case, there is no record of any immediate response of tongues or prophecy. The traditional Pentecostal view is that speaking in tongues is THE evidence of the ‘baptism in the Holy Spirit’. I do not believe that scripture gives solid support to this view. 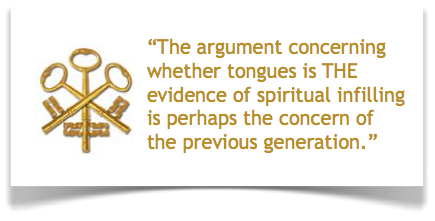 The argument concerning whether tongues is THE evidence of spiritual infilling is perhaps the concern of the previous generation. Today, the discussion tends to centre more on the nature and role of faith in receiving and imparting blessing. Jesus told his disciples to wait in Jerusalem until they received power from on high. They had faith in his words, and they must have been waiting and praying with faith until they received what he had promised. The Samarian believers received a visit from two great apostles, and heard them praying for them to receive the power of the Holy Spirit. They must surely have had faith to receive. The Caesarean converts were stimulated to faith by the powerful preaching of the Word of God. The Gospels indicate that faith was a catalyst for receiving spiritual power from Jesus. Luke 8:48 records how Jesus responded to the woman’s contact with his garments with the words, “Daughter, your faith has healed you. Go in peace.” There are several other accounts of how Jesus attributed healing to the faith demonstrated by a recipient (Matthew 8:10, 9:2, 9:29 et al.). There are also several recorded occasions where Jesus rebuked people for their lack of faith (Matthew 16:8, 17:20, Mark 6:6 et al.). Matthew 13:58 records that Jesus “did not do many miracles there because of their lack of faith.” This indicates that faith is not just a minor part of the equation, but a major component. In the instance cited, Jesus obviously had faith, but the people could not receive the healing power from him because they lacked faith. Diagrammatically, the process could look as follows. The stars indicate the points where faith is exercised. In response to prayer, the Holy Spirit anoints the believer (minister) with power. Jesus taught that God the Father will give the power of the Holy Spirit to those who ask (Luke 11:13). The one who asks must believe that he will receive what he asks for (James 1:6-8); he must exercise faith. Similarly, he needs to believe that when he lays his hands upon someone in need, then spiritual power will flow from him to her. It is not clear from the scriptural account that the recipient always needs to have faith. In the examples cited above, Jesus indicated that the recipient’s faith was the catalyst for receiving. However, there are accounts where the recipient could not have exercised faith. An example of this is the account of the dead child in Matthew 9:23-25. In the diagram, the arrow marked 4 reminds us of the fact that the Holy Spirit can, and often does, intervene directly. He does not need us in order to touch the lives of others, but he usually allows us to be part of the process, so that by participating we can grow as children of God. Models and diagrams are useful up to a point. Whilst they help us to understand some essential elements and relationships, they tend to reduce complex and often holistic concepts to just some of the component parts. Ministering in the power of the Holy Spirit can never be as clear-cut as the models I have presented might indicate. Ultimately, God is sovereign, although he graciously allows us a degree of discretion and participation, so sometimes he intervenes directly. Sometimes he sends an angel. Sometimes he acts through us. Sometimes he fills us with power and allows us to minister as we see fit. The reason I have placed emphasis on the sonship (internal) model, and stressed our responsibility in ministering, is that it is what Jesus modelled for us. As I have already mentioned, when he ministered to people he is never shown as praying for them. He sometimes declared their sins forgiven. On occasions, he did something symbolic. He even used mud, spit, and river water if the occasion demanded it. Sometimes he spoke words of authority, and sometimes he touched. But always, power went out from him and he healed, delivered, and raised the dead. In every case, he evidenced faith, and he often commented on the faith, or lack of faith, of those to whom he ministered. So, in my next blog post we’ll take a closer look at Faith.